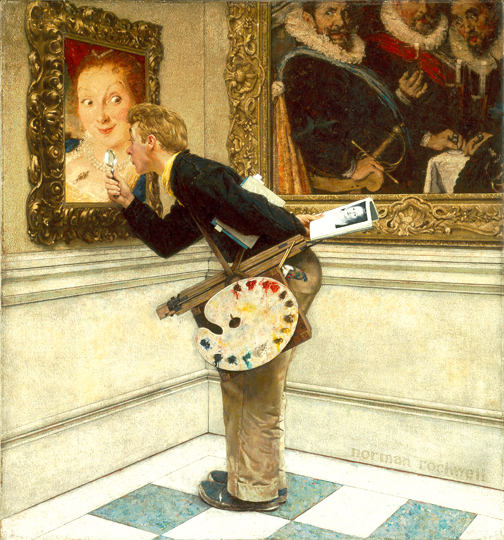 Norman Rockwell (1894-1978), Art Critic, 1955. Norman Rockwell Museum Collections. ©SEPS: Curtis Licensing, Indianapolis, IN. Stockbridge, MA, August 29, 2017— Concluding its summer lecture and performance series, Inventing America: Art and Cultural Connections, Norman Rockwell Museum will present “Art Music: An A cappella Evening with Quintessential” on Thursday, August 31, starting at 5:30 p.m. The Berkshire-based singing group, featuring tenors Al Thorp, Jay Wise and Jim McMenamy, and bass/baritones Steve Dahlin and David Anderegg, have designed a diverse program, including rock music by The Kinks, David Bowie, Lou Reed, and John Lennon, among others. The event is free for Museum members, or included with Museum admission.